What makes your department so strong? The twelve-strong communications team is responsible for the reputation management of three world-renowned hospitals: Barts in The City, The Royal London in Whitechapel and The London Chest in Bethnal Green. We focus on strategic priorities to avoid spreading ourselves too thinly, and draw on the strengths of individual team members and different communication channels to get to our target audiences with clear, consistent and coherent messaging delivered in a compelling way. Are there any specific initiatives you think may have contributed to your nomination? The team’s main focus during the last year was the Barts Cancer Centre Campaign. The £200 million Barts Cancer Centre is the first phase of a £1 billion investment at our hospitals. We had to realise the value of the £200 million investment in the centre in reputation terms. Wherever possible we measure our impact on actual behaviour, but in this case, national public awareness was a more appropriate metric. We benchmarked the public’s association of Barts with excellence in cancer care nationally before the campaign and then after. Following the campaign, the association of Barts with excellence in cancer care had jumped by 6% relative to our benchmark. In addition, the patient, GP and staff communications campaign relating to the move was also successful: telephone surveys of staff established a high level of awareness and understanding prior to the move, and the move itself went smoothly. These results represent a high ROI, given the campaign’s limited non-pay budget of £25k from the NHS, augmented by a further £50k from partner organisations. What did the external communications campaign involve? A stakeholder preview programme: an extensive programme of visits led by the communications team enabled over one hundred senior healthcare partners and other stakeholders to preview the centre before patients moved in. Visitors were partnered with appropriate hospital directors to further develop key relationships. Media campaign: a sustained programme of features in the nationals raised public awareness of the centre’s ground-breaking research. Sub-campaigns targeting non-healthcare specialist media covered the construction, architecture, environmental and IT angles. This coverage reached an estimated audience of seven million. 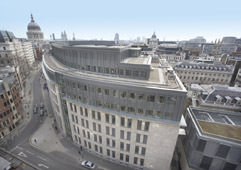 New digital communications channels: the Barts Cancer Centre website was launched, and preparations for the centre’s opening and the opening itself were covered on Twitter and Flickr. Twelve innovative videos launched the new Barts Cancer Centre channel on YouTube – patients diagnosed with cancer across the world now have access to advice on the latest treatments from our leading experts. Existing external communications channels: the campaign’s key messages were also communicated to target audiences through core external communications channels, including the corporate website and printed and electronic newsletters targeting GPs and the 8000 patient and public members of the proposed Barts and The London Foundation Trust. What internal communications activities took place? Forging a communications partnership with internal teams: a member of the internal comms team worked closely with ‘move managers’ within each of the clinical teams, who were communications leads and advocates within their areas and fed back key issues to the communications team. Staff orientation and contact programme: a series of open and departmental presentations ran alongside a full programme of staff orientation visits to the new centre, prior to its opening. Creating new comms channels: ‘Move Matters’, a weekly electronic newsletter, was created for staff moving into the new centre and a Barts Cancer Centre channel was created on the intranet. Using existing internal communications channels: key information was also communicated to all staff through the Trust’s intranet homepage, weekly printed and electronic bulletin, special launch bulletin, monthly electronic management briefing, and a bimonthly staff news magazine. What are your three top tips for other non-profits looking to improve their PR? Don’t assume you know your audience and what drives them. At Barts we use audience insight to help us change attitudes and behaviour whenever we can. If we don’t have a research budget, we organise our own focus groups. For example, we used focus group research undertaken by our healthcare partners in NHS Tower Hamlets to inform a major campaign to improve the uptake of breast screening in the borough. Make use of behavioural science. There are certain behavioural norms that we can tap into that can help us to frame key messages in ways that will be more influential with our target audiences. As a team we are using behavioural science increasingly, particularly in our social marketing campaigns. Psychologists also tell us that people like stories and use them as a frame of reference to help them make sense of the world. We’ve found that story-telling is a powerful method to hold attention, make messages more memorable and get people to think differently about things. Don’t be afraid to be different. The theory of social proof tells us that we tend to like to do what others are doing. Being different is risky and the public sector is particularly risk averse. This can protect reputations, but it can also inhibit innovation. Likewise, established best practice can become a tyranny that suppresses new and even better ideas. At Barts we try to make a virtue out of necessity by looking for creative ways to get the most from our small non-pay budgets. Value for money is always important, but for non profits right now we all know we have a strong obligation to make the most of every pound we spend. Creativity and lateral thinking can help. Susan joined Barts and The London in July 2003. An award-winning PR professional, she has specialised in challenging reputation and issues management roles. Previously she was Head of Special Projects for airports group, BAA plc.